Cross-pollination helps over 30 percent of the world’s crops, and over 90 percent of wild plant survive and thrive. Without our buzzing striped friends we’d be struggling to find a seed-spreader as efficient as their tiny legs. 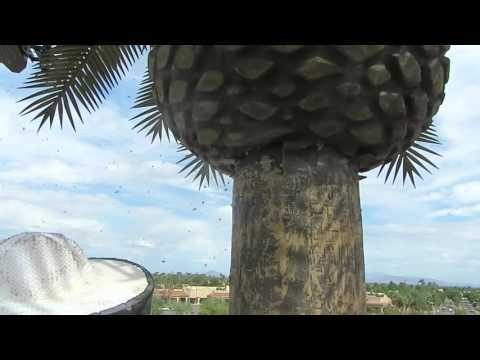 Varsity Termite and Pest Control in Mesa Arizona is dedicated to solving all of Arizona’s pest control needs, but at the mercy of these beneficial insects, we’ve set out to find a gentler way to control our buzzing garden guests. Among major known pest control companies and producers of the products we use to serve our clients is Ortho. Taking a major turn for bee peace recently, they announced their disconnect from the commonly used neonicotinoid-based pesticides. Encouraging their partners to follow, we agree that there has to be a more mellow way to free our customers of their bee issues while maintaining a respect for the benefit they bring. In just one year beekeepers saw a 42% decline in the honey bee population. Trigger panic mode. Need something to relate to? What if trail mix didn’t have all of those perfectly roasted almonds, or worse – Trader Joe’s couldn’t provide us bananas, or avocados? Trigger super panic mode. 75% of our country’s fruits, nuts and vegetables rely on bees for pollination. Perhaps this alarming statistic was the final straw, acting as a catalyst for pest control companies to reevaluate what products they are using and how helpful or detrimental they can be. Combined with an approach that we often see parallels a quick-fix in this country, it is time for a major reconsideration of how to respect the way we grow our food while maintaining a healthy living environment – especially in Arizona where we often get to enjoy our summers by the pool or under a pergola. Call Varsity! Pest control in Mesa provides safety and comfort, indoor and outdoor, but the approach is crucial to our customer’s happiness and satisfaction. Varsity Termite and Pest Control is ready to align with these new safer and milder bee control techniques to help catapult the word of pest control into a more positive realm for everybody (human or insect) involved. Not only does this transition aim to support the health and vitality of Arizona’s agriculture, but also it is truly helping to align better products with safer procedures for the bees that keep us eating the foods we love. Bees are at the risk of life threatening changes and extinction; facing the demise of their ability to pollinate, learn and collect food. As essential as it is for us to breath, it’s comparable to the bee’s necessity to forage. Involve neonicotinoids and brands like Ortho and the companies that use them run the risk of being involved in the departure of fresh foods that are easily accessible and the bee population altogether. We are all creatures of habit, learning from one and another in the communities we involve ourselves in. It’s the hopes of many beekeepers, pest control companies and farmers that other garden and nursery companies will follow suit within the upcoming years. With plans to rid three of their products of the neonicotinoids by 2017 and five more by 2021, Ortho is making some major promises to environmentalists across the nation. Major retailers are taking it into their own hands to stop the cycle as well. The Home Depot recently announced its phase-out of pretreatments of plants by 2018 along with the retailer’s major competition Lowes to jump on the bee-safe bandwagon by 2019. Our blog posts could soon be honoring companies like Ortho, Home Depot and Lowes that took a giant leap to help bee colonies across the country. 5 million: the amount of pounds of insecticide reported on crops in 2010. 33%: percentage of the decline in bee population in recent decades. 12.5 million: the monetary amount paid by Scotts-Miracle Gro (Ortho’s parent company) after a guilty plea of applying massive amounts of insecticide to bird seed in 2012. These companies may not seem like they make a massive difference in the our agricultural health, but in a world where small steps matter, this may be the best news yet for our pollinating friends. Varsity Termite and Pest Control has been the leader in Arizona’s pest removal services for years including Mesa termite control and Mesa scorpion sealing – helping your family stay safe and comfortable even in the heat of our Valley’s summers. Varsity is committed to bringing you the best of the best when it comes to pest and bee removal.